We design and manufacture our products ourselves: thanks to our own R&D centre and a certified manufacturing process, we have mastered this technology. Our products are tested using the most rigorous procedures to guarantee the highest possible quality. Our factories are ISO 9001 and 14001 certified. Our broad catalogue lets us guarantee compatibility with sets of professional printers. The results of tests, compliant with international standards, performed on a selection of OWA remanufactured cartridges demonstrate the print quality of our printer cartridges. OWA laser cartridges come with a lifetime warranty, as ARMOR guarantees perfect operability and reliability for an unlimited period. OWA inkjet cartridges come with a 3-year warranty, during which time our in-house services will respond to any problem that may arise. 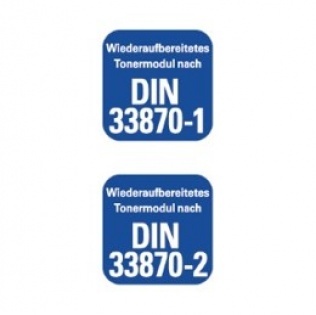 Standard established by the “Deutsches Institut fur Normung” [German Standards Institute], regulating the quality and reliability of recycling colour and monochrome laser cartridges. This standard defines the features of monochrome (33870-1) and colour (33870-2) laser cartridges, as well as the tests and conditions for their remanufacturing. It also takes into account yield and environmental and sustainable aspects of remanufactured cartridges.